The Parthian ruling class was becoming very wealthy because of the east-west trade, and the growth of cities, and through war-time booty. This class was dominated by seven families - the Suren and Karen being the most important. The family owed loyalty to the king, and provided troops (there was no Parthian army as such), but in return expected a considerable amount of freedom and independence in their own huge estates. It's been seen as a fore-runner of the European feudal system, and like medieval European knights, they lived by a demanding code of chivalry: they must be brave, loyal to friends, obedient, but protective towards the weak. Their culture involved horsemanship, hunting, archery and fencing - together with feasting and drinking. As the seven families became more powerful locally, so the king in Ctesiphon became less important. This lack of a really strong central government and a strong army (compare the "four principles" of Darius and the Achaemenids) was beginning to make the Parthian state less effective. The Parthians are mainly known (if at all) because of their long rivalry with the Roman empire - as a phase in the great war of civilisations between east and west, that began with the Trojan War, continued in the wars between Greeks and Persians, Romans and Parthians, Byzantines and Sasanians - and so on up to the present. Needless to say, the eastern empires have rarely if ever seen it this way. And there's more to the Parthians than being just "a menace to the Roman empire". Under Valaksh I and his son Pacorus II, Parthian interest in the eastern parts of the old Achaemenid empire revived as can be deduced from Parthian influence on coinage, although they were soon to fall to the great Kushan empire. 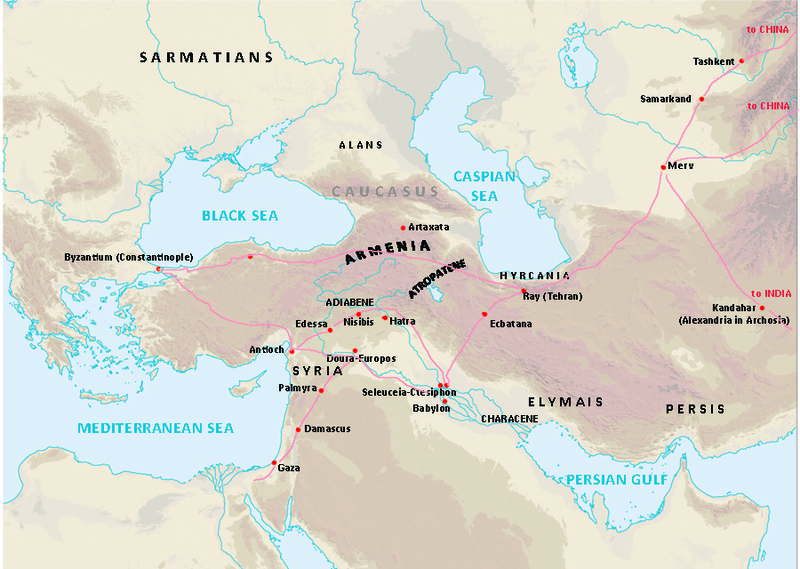 The far eastern parts of the empire - once Achaemenid, then Alexander's, then Seleucid and Parthian - had by AD 100 fallen to the Yuezhi, now known as Kushans. They had taken over from the Saka, who'd themselves taken over the Greco-Bactrian kingdoms. From their base in Bactria, they had expanded south into India, north into central Asia, and, between AD 100 -200, eastwards into China. The Silk Route had flourished since the reign of Mehrdad I - and more than just goods were moving along it. The Buddhist philosophy, which had originated in India in the 6th century BC, was now travelling along the trade routes into China. In AD 148, An Shigoa (An Shih-koa), a member of the Parthian royal family, took up residence in the Han Chinese capital at Luoyang. He translated numerous Buddhist writings into Chinese for the first time, and established temples. He was followed by other Parthian Buddhist monks. Other goods traded with China (besides silk and other luxury items - jewellery, spice, perfumes, animal skins) included the war-horses (Nisaean horses) used so effectively by the Parthian heavy cavalry. The pomegranate and vine went east to China, while peaches and apricots came west in exchange. "Chinese iron" - steel, that is - was also a much-valued import in the west (although the Parthian steel, used in armour for men and horses, was also valued). Few merchants travelled the entire route - they relied on middle men, especially the Sogdians with their capital at Samarkhand. 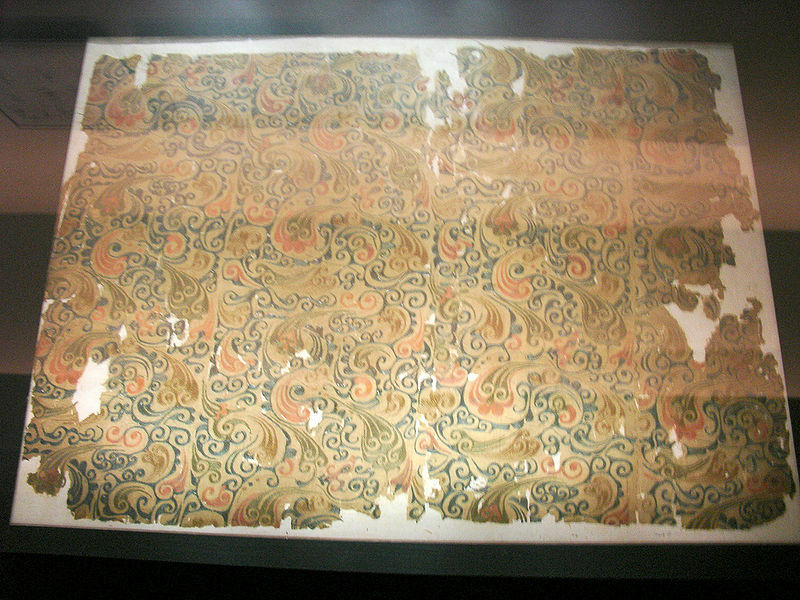 There are some touching letters written by a Sogdian wife abandoned in China when her husband did not come back for her. More about the Sogdian letters here. Arabs - immigrants from the Arabian peninsula who dominated the wealthy caravan cities of Hatra and Palmyra. Armenians - from the north. Jews - refugees from the destruction in Jerusalem in AD 70 joined those who'd originally been transported there by Nebuchadnezzar II (and not returned when allowed to by Cyrus). Remains of a synagogue have been found at Dura-Europos. Persians - from Persis, no longer the centre of the empire of the Parthians. Greeks - the cities of Dura-Europos and Seleuceia kept their Greek character - but the Greek language elsewhere began to be replaced with Pahlavi (Parthian). Characene (Mesene) was allowed to exist as a semi-independent Arab-ruled kingdom within the Parthian empire, from about 127 BC. It controlled the ports in the Persian Gulf, and the sea-route to India began there, and hence was the source of much revenue. It was retored to full Parthian control in around AD 150 by Valaksh IV. Elymais had a similar status, with its own kings. Elymais was the old Elam, with its centre at Susa (Shush). More here. Adiabene. This small kingdom, squeezed between Mesopotamia and Armenia, had been, since the Achaemenids, a "client" state (part of the empire, but self-governing). Its policy was to support Armenia or Parthia, whichever was stronger at the time. Its ruler Izates I (AD 36 - 60) converted to Judaism - Adiabene supported the Jews in their unsuccessful attempt to avoid colonisation by Rome (AD 66 - 70). The site of the Battle of Gaugamela, where Darius III was finally defeated by Alexander is in Adiabene. More here. 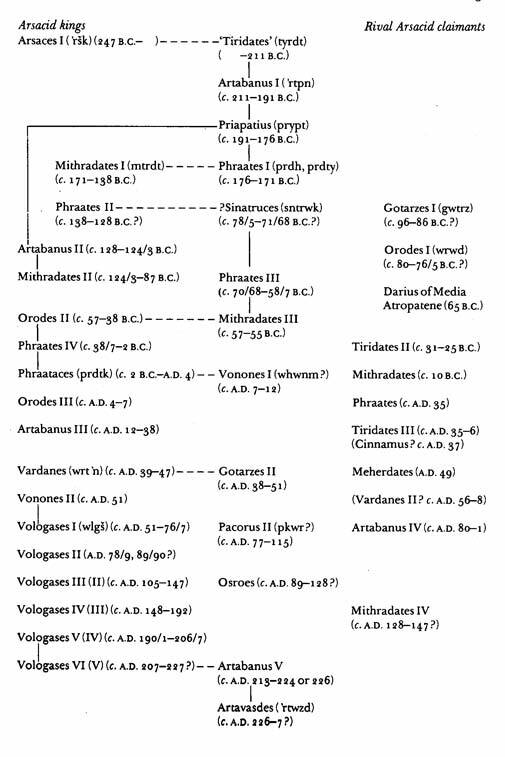 Osrhoene. 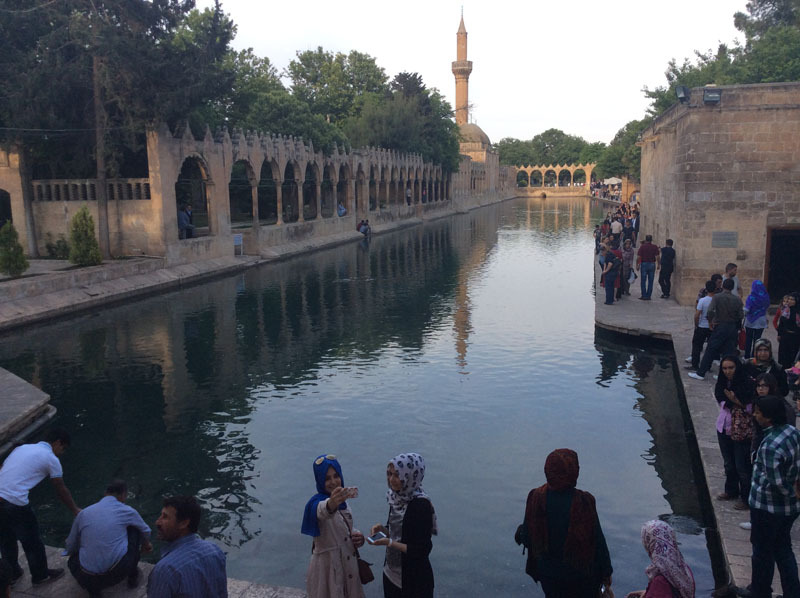 Another small kingdom (often known after its capital, Edessa now Urfa or Sanliurfa in Eastern Turkey) between Adiabene and Syria - nominally part of the Parthian empire (to the east of the Euphrates), but virtually self-governing. According to legend, its king Abgar V (4 BC- AD 7 and AD 13-50) was the first Christian king. Its founders were Nabataean Arabs originally from the region of modern Jordan. Despite its Greek name (Edessa after the city in Macedonia it was thought by Alexander's men to resemble because of its abundant water supply), it was Syriac speaking and strongly anti-Greek. Prior to the conversion to Christianity, there had been a cult of the "mermaid" goddess Atargatis, involving sacred fish. The fish are still there, but since the arrival of Islam, they've been associated with Abraham. More here. Hyrcania. Latterly a reluctant part of the Parthian empire: it had challenged Valaksh I's rule, and was happy to help the Alans when they invaded in AD 72 - 75. North of the Caucasus mountains and the Black Sea was the territory of the Sarmatians - an Iranian people, who had ousted the related people called Scythians by the Greeks. In AD 72 - 75, while Valaksh I was ruling Parthia, an offshoot of the Sarmatians, the Alans, crossed the Caucasus. They caused havoc in Armenia and moved south into Atropatene. Parthian forces were overwhelmed - and Valaksh I - he must have been desperate - asked for help from the Romans. Valaksh II was king from AD 77 - 80. By then the Alans had looted all they could and were returning northwards - those that stayed were soon absorbed into mainstream Iranian/Parthian culture. NEXT: ROME JUST CAN'T LET GO. Growing prosperity in Parthia - but the power of the noble families is creating a potentially unstable situation. The victor over Rome at Carrhae in 53 BC was a Suren, providing his own private army of 10,000 horse archers. According to the story (in the Doctrine of Addai c AD 400) King Abgar was suffering from leprosy and wrote a letter to Jesus, asking if he'd come and cure him. Jesus wrote back that he didn't have the time, but sent a picture of himself and promised to send a disciple to do the job. He did and Abgar converted. It's very unlikely to be true, however. But by the 3rd century AD Edessa was a thriving Christian community - proud of its letter from Jesus and his portrait. For more on this quaint legend see Mandylion in Wikipedia. There's also a tradition of the apostle Thomas visiting the Indo-Parthian king Gondophares, who ruled from Taxila in Pakistan in the 1st century AD.